For the present party I hosted last week, I wanted to send my guests home with a little treat. I found a recipe for candied almonds on Pinterest and though it would be the perfect thing. The first batch was made following this recipe, but we found it a bit dry and bitter for our taste. So, I adapted it a bit and came up with this. 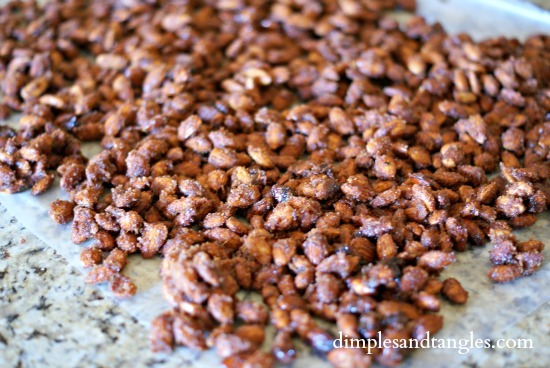 They turned out SO yummy and reminded us of the warm candied nuts that we like to purchase at treat stands. They are super easy to make, and are actually made in the crock pot! Spray the crockpot with Pam first for easier cleanup (with a soapy hot water soak when your crock has cooled it shouldn't be too hard to clean up). Turn crockpot on high and add butter to the bottom. In a large bowl combine the egg white, vanilla, and 1/2 t. of the salt. Pour almonds in mixture and stir to coat. In a separate bowl mix the sugar, cinnamon, and remaining salt. I add about a teaspoon or more of salt here-we like them a bit salty but you can adjust to your taste. Pour cinnamon and sugar mixture over the almonds and stir to coat. Pour the coated almonds in and cover with lid. Cook on high for 2 hours, stirring well every 25 minutes. Towards the end they have a tendency to burn, so stir well and don't cook too long. Pour hot nuts out onto waxed paper sprayed with cooking spray and let cool. Break apart chunks if needed and scoop into treat bags. 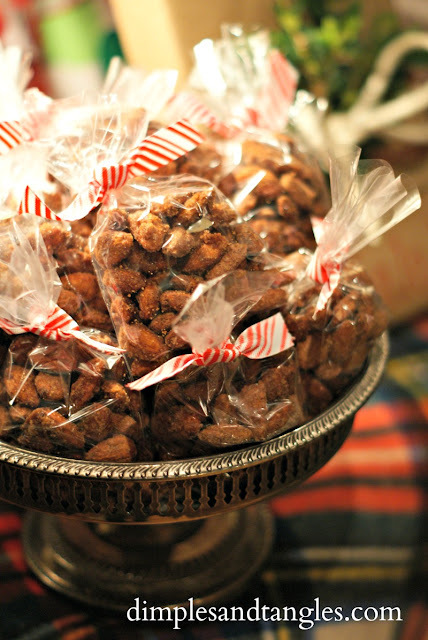 When they are in a clear treat bag tied with a festive ribbon, you're all ready to give your guests a yummy party favor! Just fair warning though...they're highly addictive! Hope you had a wonderful Thanksgiving weekend Jennifer! OMG do they look GOOD!! Great idea! Yummy! Those look so good and would make wonderful little gifts. I'm definitely going to try this. I wonder...if I were going to give them to neighbors say the week of Christmas...how soon could you make them ahead? Do you like that writing? Oooh, I'd be in trouble ~ I love them in salads, too! Isn't it amazing what you can make int he crock pot?! These sound delicious! 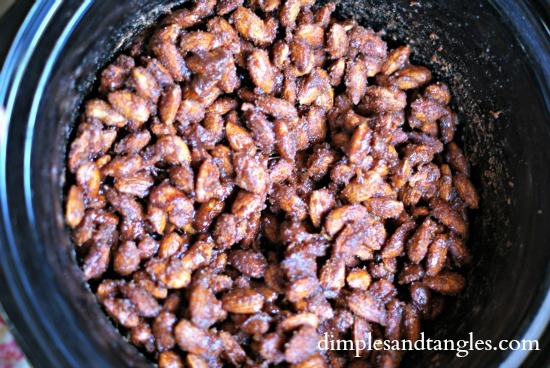 I love flavored nuts, and have wanted to try making them at home! Thanks for the recipe! Also, you have them so beautifully packaged, I love it! I am addicted to these babies! This could be trouble!! Thanks for the recipe! Seriously, in the crock pot? I'm pinning this.. Thanks for the recipe! I loooove candied pecans, so I know I will love these. Besides....almonds are healthy. Heehee. I never use my crock pot. Time to dust it off!! !